Notice the spelling on "nite". That's what the kids call "being with it". Just so you know. I'm not going to pretend (That's a lie, we all know pretending is what I do at least 80% of the time to make up for stuff I don't know) to know what I'm talking about when it comes to the late nite wars between Leno and Conan because truth be told I'm passed out most nights by 10 anyways. 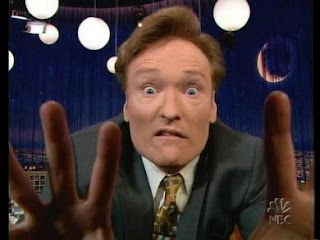 However, back in my youth when the chicken finger devouring machine I call a body only required 15-20 minutes of sleep every night I would always stay up for Conan, and based on my previous knowledge (and his Boston roots) it's pretty obvious that Leno is being a chooch about this whole thing. In general the only positive thing that Leno even brings to the table is the fact that anyone who chooses to do an impression of his high pitched balls-not-dropped-yet voice is usually able to hit it dead on by simply pushing on one testicle just hard enough, therefore inducing laughter in the room. Jay, I credit you with that humor. While a good ball push always brings out a strong larf among fellow party goers, trying to sound like any other late night host doesn't require someone to put their reproductive organs (checking to make sure that's atomically correct, ok we're good) at risk. Jay, I dis-credit that same humor previously handed out. I am biased towards Conan? Hell yes. Are my reasons just? Eh, they don't really have to be, and I'm ok with that. And please, please, be careful with the ball push. Don't let Leno ruin your night even when he's not on TV.